As federal investigators try to pinpoint the exact source of the salmonella that tainted more than half a billion eggs, attention is now focusing on whether the contamination might have been prevented. One preventative measure is a salmonella vaccine, given to chickens to prevent them from getting the bacteria and passing it along in the eggs they lay. The Food and Drug Administration weighed in on the issue last month, saying there was "insufficient data on the efficacy of vaccines" to support a mandatory vaccination requirement. Attention is also focused on the nation's food inspection system. CBS News obtained a series of state inspection reports of one of the companies linked to the recall -- Wright County Egg of Galt, Iowa. Each report shows during separate visits last April, the state inspector did not check any of the 27 points on his safety checklist, including whether the facility was free from the "presence of birds, insects, rodents," and whether shell-washing equipment was in "clean and sanitary condition." A spokesman for the Iowa Department of Inspections and Appeals says the inspector did not do more because the facility had "a full-time USDA inspector on site," as noted on the reports. Yet the U.S. Department of Agriculture says its official on site was not an inspector at all, but rather an "egg grader" -- responsible for measuring eggs and looking for cracked shells. 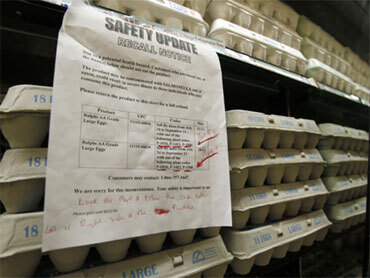 Critics say that confusion over responsibility for food safety is not surprising. "When you have multiple agencies in charge of a single issue, sometimes no one is in charge," said Caroline Smith DeWaal with the Center for the Science in the Public Interest. Inspections are the responsibility of the FDA, which had never inspected the farms. "They don't have the inspectors and they haven't had the mandate to really do effective food inspection for these facilities," DeWaal said. That may be the case at more than half the nation's food production facilities. An Inspector General's report in April found that 56 percent of food production facilities have gone without an FDA inspection for at least five years, despite recent recalls of tainted spinach, tomatoes and peanut butter. The FDA hopes to change that record under new federal rules that require, among other things, more rigorous testing for salmonella. Still, both the FDA and critics agree -- Congress needs to take the next step to pass a food safety bill that's now stalled in the Senate. It would give the FDA mandatory recall authority and additional resources to conduct more frequent inspections. Valuable tools, they say, that could help prevent tainted food from reaching Americans' tables.